They went in and shut the door. But even as he did so Sam heard suddenly the sigh and murmur of the sea on the shores on Middle-earth. Sauron Defeated is the nineth volume of The History of Middle-earth and it completes the telling of Tolkien's writing of The Lord of the Rings. It also includes The Notion Club Papers, which were penned by J.R.R.Tolkien, and are a report of the discussions of an Oxford literary club where Tolkien and C.S.Lewis were both members. Included as a part of these reports is The Drowning of Anadune which parallels, in many ways, the mythical tale of the drowning of Atlantis and concludes with Lowdham's Report on the Andunaic Language. 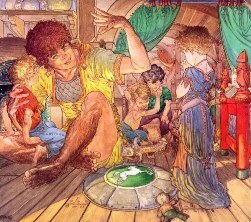 ♦ Sam talking to his children long after Frodo has departed the Grey Havens. In The Epilogue, he tells them of an upcoming visit by King Aragorn and Queen Arwen, as well as answering their questions about Bilbo and Frodo. Absolutely priceless reading, not to be missed. ♦ You will see that in the original writings on The Scouring of the Shire, Frodo takes a far more active part which, in turn, changes the nature of this part of the story dramatically.